A couple of days ago, Google announced that Google Apps users can now access Google My Maps right from their Google Drive account. 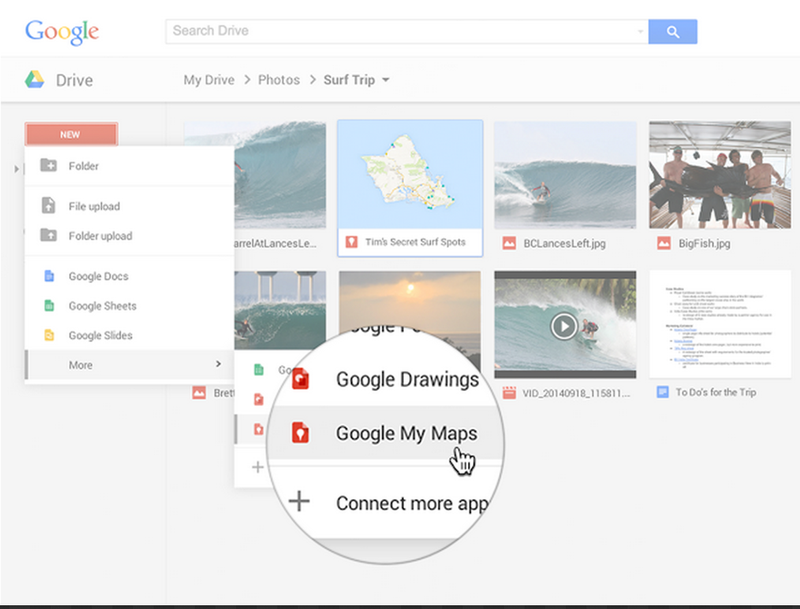 This means that you can seamlessly create, manage and share your custom maps directly from your Drive. To locate My Maps in your Drive, Click on ’New’ then select ‘more’ and click on ‘ Google My Maps’ as shown in the screenshot below. My Maps by Google allows you to create custom maps to share and publish on the web. You can easily visualize and map data, search places to add to your map, draw lines and shapes, add colors, marker icons and labels, and customize your maps the way you want. As a teacher, you can use My Maps for a variety of educational purposes from giving directions to students and parents for next field trip to organizing virtual trips to world museums and art exhibition. Some advanced features provided by My Maps include: creating layers to group various parts of your map enabling you to choose the ones you want to display or hide. And if you have data stored somewhere else, you can import it in the form of a CSV, TSV, KML, or XLSX file or as a sheet from Google Drive. We are planning to post a detailed guide featuring a wide variety of resources and tutorials on how to use Google My Maps in your class. Stay tuned.